Planning for the future price of emitting one ton of carbon dioxide can seem like a game of chance, in which electric utilities and other stakeholders are forced to bet on uncertainties. However, considering state and regional policies that are already in play—as well as proposed federal legislation aimed at reducing emissions—it would be a bigger gamble for utilities to assume that there will be a CO2 price of zero in the long run. 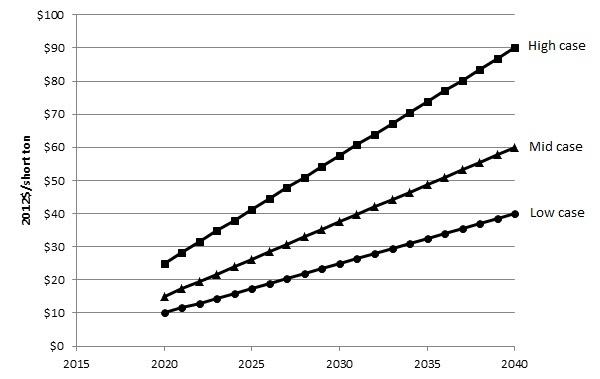 In our 2013 Carbon Dioxide Price Forecast, released this week, Synapse projects that federal regulatory measures combined with state and regional policies will begin to put economic pressure on CO2-emitting power plants throughout the U.S. by 2020, and that prices will continue to rise through 2040. The report updates Synapse’s 2012 CO2 price forecast with new data and is intended to be used as a resource for utility integrated resource planning and other electricity planning analyses. We developed the 2013 forecast based on thorough analysis of proposed federal regulatory measures, ongoing state and regional policies limiting CO2, the price of CO2 already being factored into federal rulemakings, recent CO2 forecasts from 28 utilities, and policy analysis and modeling from the research community. Our three price trajectories (shown in the exhibit below) represent different levels of political will for reducing emissions. The lowest case represents a scenario in which federal policies exist, but are only modestly stringent. The highest case represents a scenario in which one or more of the following factors leads to higher CO2 prices: more aggressive emissions targets, greater restrictions on the use of offsets, restricted availability or high cost of technology alternatives, more aggressive international actions, or higher baseline emissions (meaning more aggressive reductions are required). To read more about the factors that influenced our forecast and to see how it compares to recent utility forecasts, the federal carbon price used for rulemakings, and other price trajectories, access the full report here.